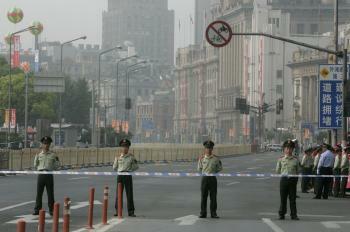 As the Olympics approach, major cities in China are filled with soldiers and police. Not only does Beijing look as if it’s facing a formidable enemy, even Shanghai, as human rights lawyer Zheng Enchong has described, is in a state of semi-martial law where civilians are treated as terrorists, which has caused major complaints. Zheng says, “Civilian mentality is to not attract trouble. Even though it’s summer now, the kids are reluctant to go to the Internet Cafes. People are afraid of going outside. Everyone feels the terror of the Olympics. The CCP claims the Olympics is not about politics. Yet, people are treated like a terrorist even when holding a bottle of water or a bag.” He sighs.